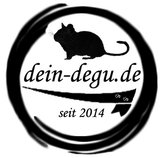 The Original coat patterns of degus is agouti (agouti), now there are also Blue / Blue agouti (anthracite gray to steel blue), sand / red (clay colored to cream) and black degus. 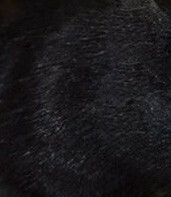 In addition, various piebald ranging from blazes, point look, Stark look to super look. 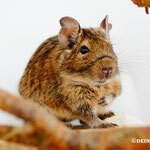 Many color variations caused by a recessive gene , which means , as with many other species that Degus originate with these colors from a story with inbreeding . Meanwhile, the colors are basic colors by crossing healthy stable again. The coat shows a so-called " ticking " . 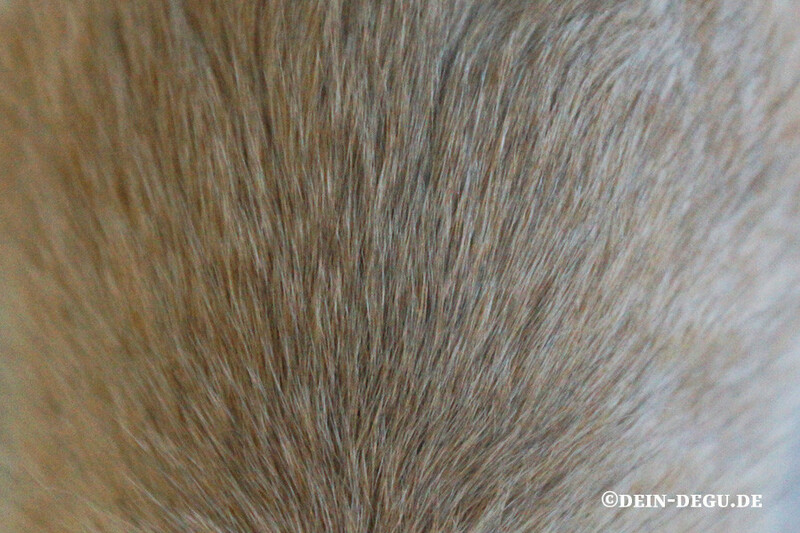 Ticking means that each hair has a harness of at least two colors . 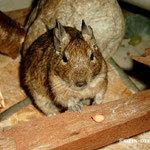 In this Agouti are reddish yellow and black , making the hair appear brown-black; the belly is lighter colored . The eyes are black . 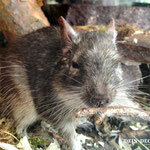 The wild color Agouti dominant inherited , the hair is brown in the middle and gray / black brown on top and in the undercoat. 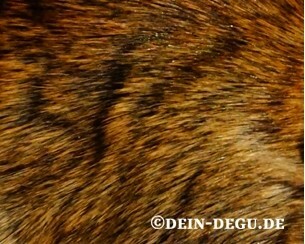 Around the eyes , ears , belly and neck the skin is much brighter . The Agoutilocus ( a) is the gene for the agouti signaling peptide ( ASIP ) , whose function will be simultaneously affected by the melanocortin receptor 1 ( MC1R ) extending from the extension locus (E) is encrypted. 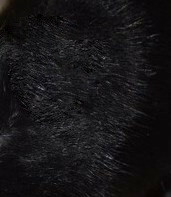 Blue , the second color variations which was grown and inherited recessive and causes homozygous a brightening of the entire coat. 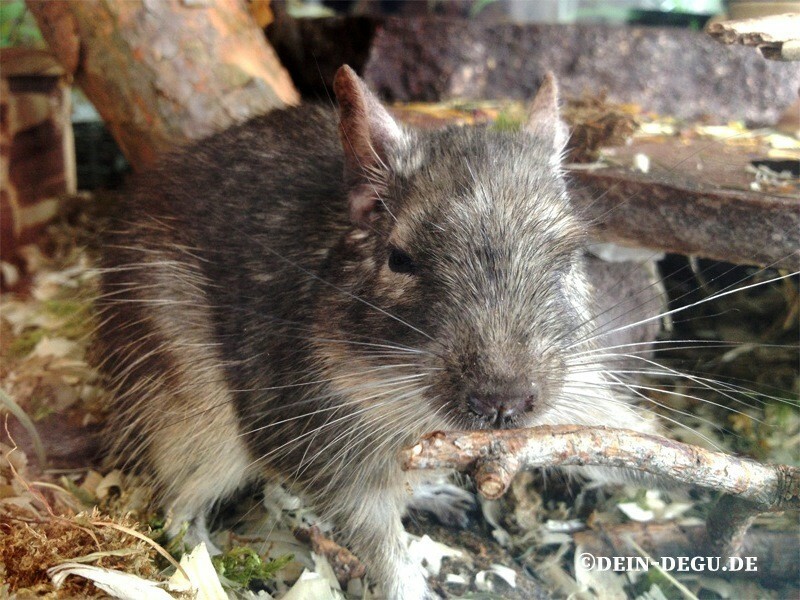 This is probably separated the brown and gray part of the coat color due to a mutation in the colors of the agoutis has emerged . 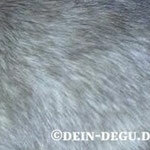 Again, around the color of the fur around the eyes , ears , belly and neck much brighter . Looking at the blue variants in other species , it can be assumed that it is all the same mutation called Dilution ( d / d ) . 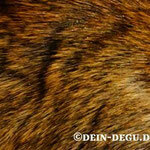 As Dilute gene ( eng . 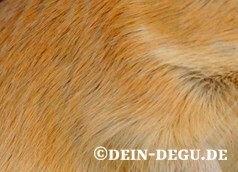 Dilute "dilute" ) or dilution gene are at different animal species referred to different genes lead their mutations to a lightening of the intensity of coat color. 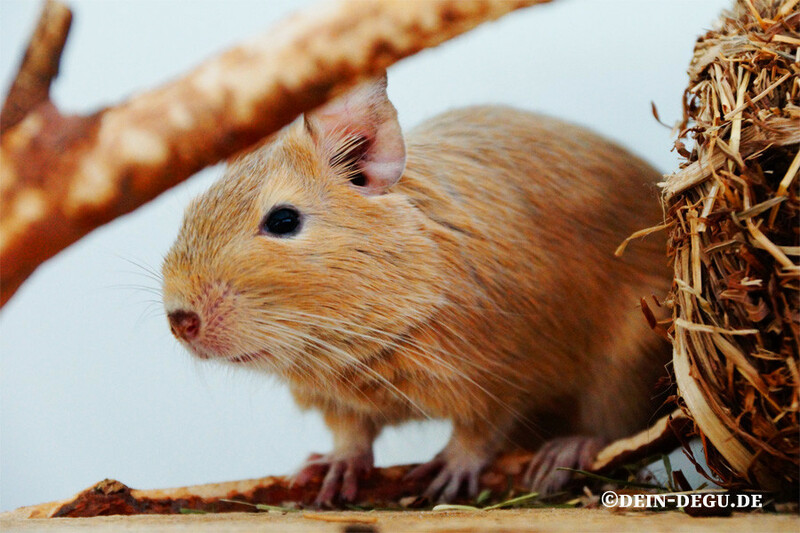 Sand colored degus have been around for several years , the color is inherited recessive . 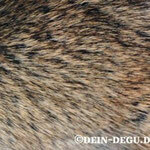 The lightening of the skin color around the eyes , the ears , the abdomen and the neck is only barely recognizable . 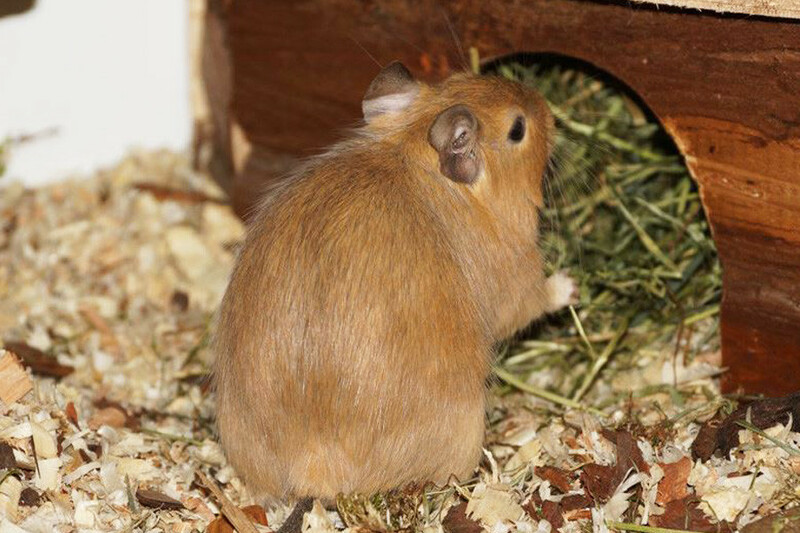 The extension mutation is recessive and causes homozygous the spread of red Phäomelanins throughout the hair , so no dark eumelanin longer visible. 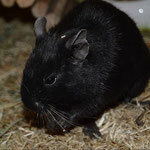 The black color was confirmed recently when degus and will most likely caused by a non- agouti mutation . 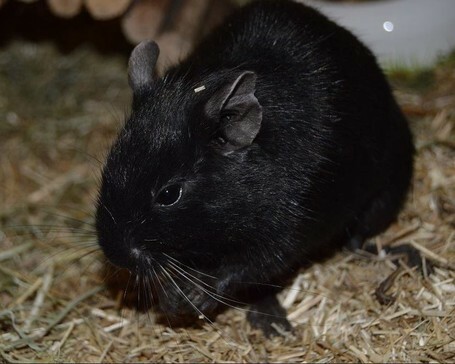 It is expected that starting from this animal and its wild colored sister future an increasing number of black degus and new combination colors will make their way to the market . 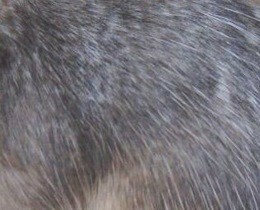 The mutation causes that the black eumelanin is propagated from root to tip throughout the hair , while the yellow pheomelanin is no longer visible . 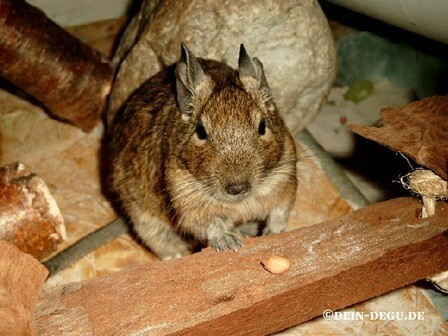 Thus, non - agouti has exactly the opposite effect to the Rotaufhellung ( sand ) . 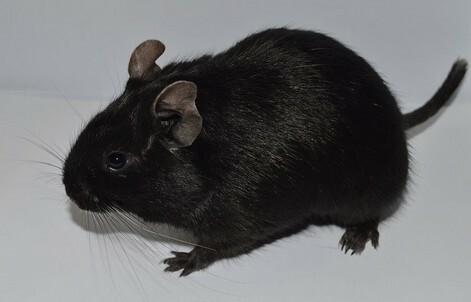 Mutations of the Agouti locus , the black can be magnified in the coat patterns ( Nigrismus ) to , in extreme cases , the entire body is black (Skotasmus) , so it arises " melanism " in varying degrees. 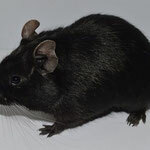 By Agoutilocus induced melanism is recessive. 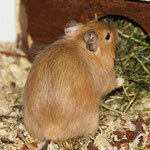 Cream / Crème degus there only a short time , has emerged the . 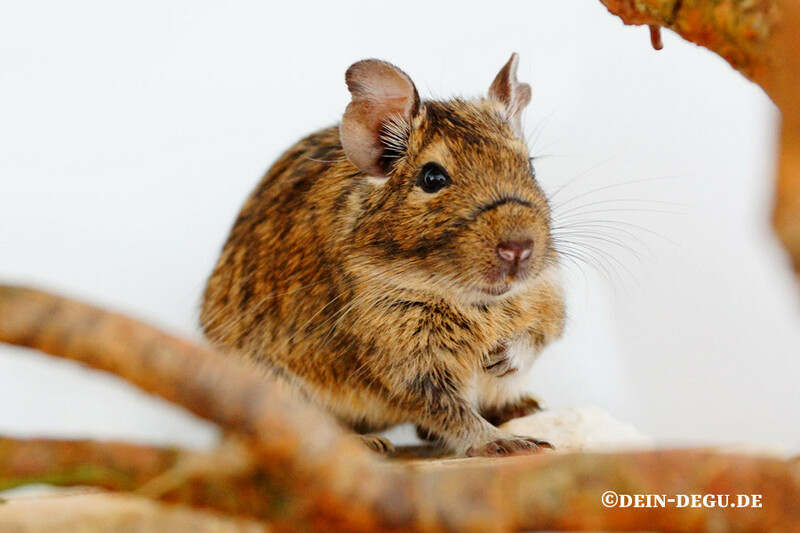 By the matings of sand -colored and blue animals The coat is lighter than that in sand -colored ( Red ) degus , the hue is reminiscent of champagne . 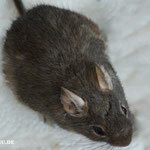 If the degus are grown changed the coat color and becomes darker , the hair tips are colored gray. 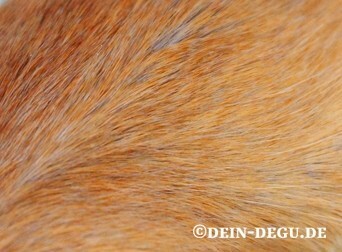 Strictly speaking, knows no color , but I ask this staining as Tricolor / Colour / multicolored ago . 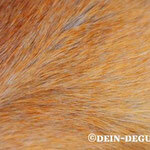 So far, nothing about the inheritance of this color is known , all three color ingen degus are randomly throws. The first three images are blue look with light tan / brown mahogany colored shimmer . 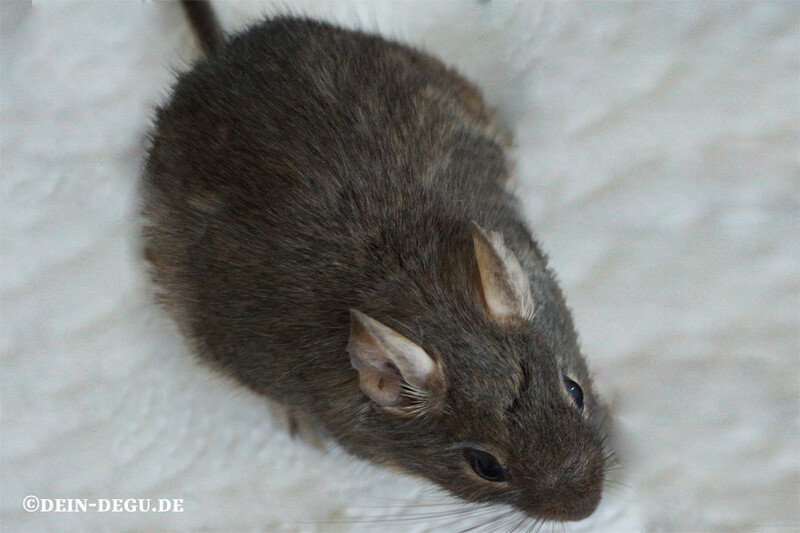 The latter image is a Blauscheckin with sand-colored point of Little Kings degus. 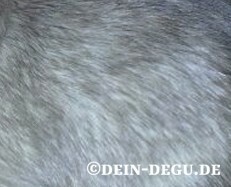 Piebald , heterozygous ( W / w ) , ( Agouti / - Blue / - Sand with white ) come now often with the three " primary colors " of degus before , but there are also piebald between other color or tri-color degus Blue / Sand / White , know where not strictly regarded as the color . The spotting is inherited dominant. Homozygous piebald W / W ( homozygous ) "white bodies " are very rare in the mating of two piebald . 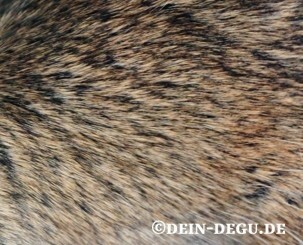 Whites have no pigmentation in the skin , even around the eyes , on the neck , or the tail as is the case with Super look . Whites do not have high life expectancy and usually die after a short time . Please do not confuse with Super look ! 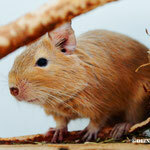 Depending on the amount of white degus are called different; Pinto, Stark tobiano pinto or Super . 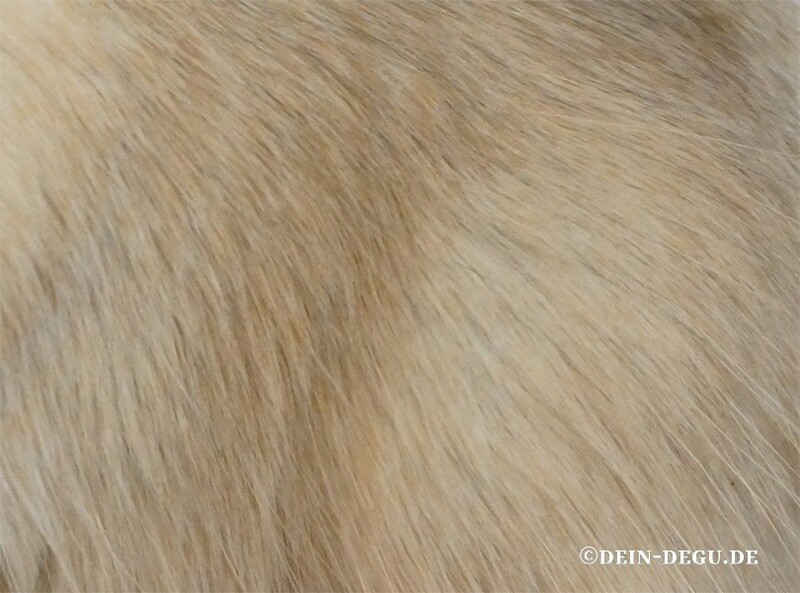 In animals with very high percentage of white can be seen sections of hair with residual coloration often around the eyes, ears and tail .